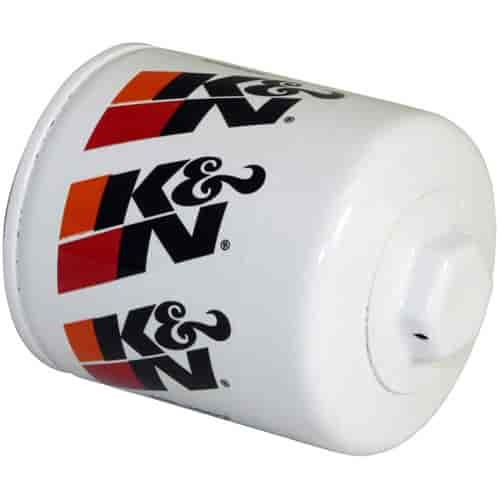 K&N PS-1007 - Pro Series Canister Oil Filter Height: 3.75"
The K&N Performance Gold Oil Filter was designed to satisfy the high performance crowd, who knows that the secret to engine life is keeping the gritty stuff out of the oil. This filter exceeds the requirements of many high performance engine builders by trapping contaminants as small as 10 to 20 microns while flowing up to 16 gallons per minute. Constructed to provide over 550 psi hydrostatic burst strength. Resin-impregnated filter element provides maximum filtering surface for contaminant removal. Inner core provides extra structural support to prevent filter collapse. Anti-drain back valve prevents oil from draining back into crankcase during engine shutdown, eliminating dry starts. Internally lubricated gasket provides a positive seal and allows easy installation and removal. Metal leaf spring (instead of paper) provides a positive seal between the element and lid. Does K&N HP-1007 fit your vehicle? HP-1007 - K&N HP Series Performance Gold Oil Filters is rated 5.0 out of 5 by 3. Rated 5 out of 5 by Bud Man from Best oil filter I have been using K&N oil filters for over 20 years and have never been disappointed. SpillFix RDSPL3L - Liquid Spill Absorbent, 3 Qt. Jar | Cleans oils, fuels, etc.